To sufferers of the illness of addiction, music can be the bridge back to feelings of self-worth, trust and confidence, and help restore faith in a life free of substance misuse and the destructive lifestyle it entails. The music group at NECA is proving to be a stepping stone for those seeking to free themselves of the past by learning an instrument, writing song lyrics, singing, and more recently recording themselves using musical software. On a practical level we knew from the start it would be difficult because we knew the transient nature of the client base. We also knew because of the collaborative nature of making music we had to cater for beginners as well as clients who maybe have played an instrument before, and then somehow get them to form a coherent whole, i.e. to play together regardless of their ability or experience. 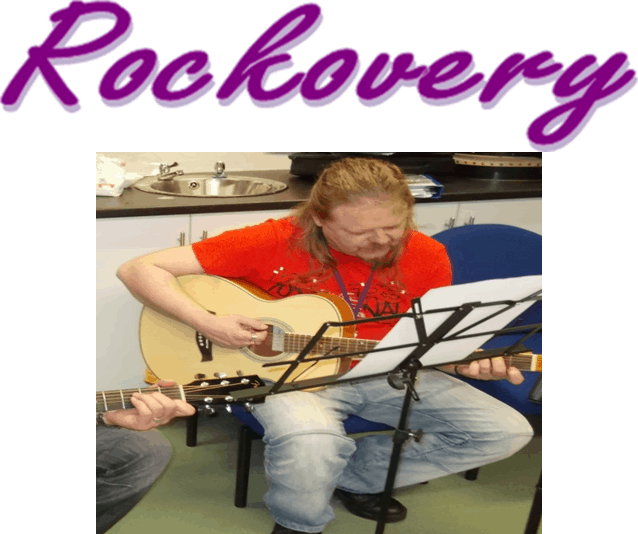 This has proven to be not as difficult as first thought, as service users quickly realise it’s not about been a great singer or player, as all you need to bring is commitment, respect, an open mind and the old Rock n Roll attitude of ‘let’s give it a go’! A session usually goes like this……The usual hellos, catch ups, introduction of new members and a coffee, where then we decide what songs we are gonna have a go at or revisit. We then take hold of our instrument of choice and work through each section making sure we don’t leave anybody behind or isolated. There are no genre boundaries, from rock to pop, old and new is all fair game. We use lyric sheets and basic chord charts and take the basic skeleton of the original and make it our own. After a break we reconvene and run over previous songs and maybe attempt to write one of our own. Songs we have played together include Get Back, 3 little birds, Price Tag, Fields of Gold, Let it Be and many besides. Where do we go from here? Maybe get a little more ambitious on the recording side? Maybe think of playing to a small audience? Really, just “Let it be” (to coin a McCartney song lyric), the benefit to the service users willing to come along is enormous without any grand ambitions. The music group is a special place for unique people with the courage to fight for their lives back. In the two hours we share music and our company, all woes are left at the door, all talk of addiction forgotten, and just a meeting place where expression of feeling is ok and faith in “others” is restored.